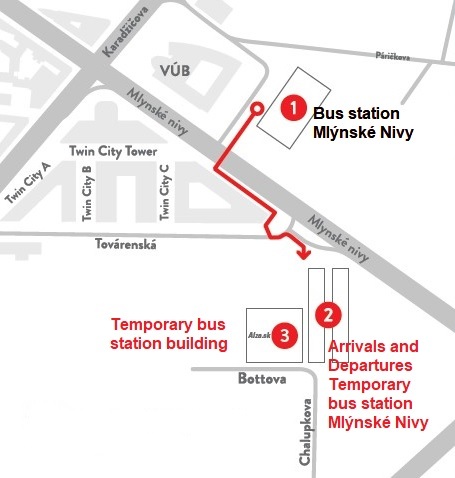 From 1/10/2017 RegioJet buses are departing from / arriving to the temporary bus station Náhradná autobusová stanica Nivy on Bottova street. 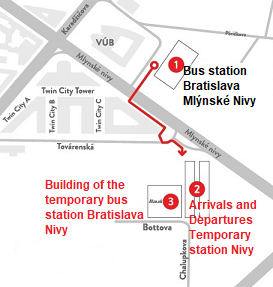 The original bus station Bratislava – AS Mlynské Nivy is closed due to reconstruction 2017–2020. Náhradná autobusová stanica Nivy is 4 minutes on foot (across the street). Public transport journey planner, (For planning your trip enter from „Letisko (Airport)“, to „Autobusová stanica (Bus station)“ and your date and time of arrival).